Upgrade to the style and convenience of modern Decora rocker light switches - you'll love the way your room looks! Are you adding lighting or building new and wondering about what types of electrical rocker light switches you should install? There are several variations of the modern rocker switch, so review these options to find the best choice for your home or business before you buy. Rocker switches are known by several names, but all devices (except as noted) fit the large rectangular wall plate openings that are variously referred to as Decora, block, decor, rocker, paddle, modern square, or decorator switches. 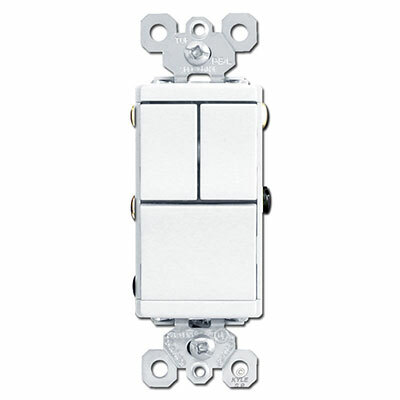 Modern Rocker Switch Introduced first in the late 1970's by Leviton then later by other manufacturers, this "new switch" fits into large square (rectangular) openings in contemporary wall plates. ADA compliant, their large paddle makes them easy to turn on and off with an easy flip of the wrist or even the poke of an elbow when your arms are full of laundry, groceries, or sleepy kids. Find 15A and 20A options available as well as single pole, 3-way and 4-way versions. 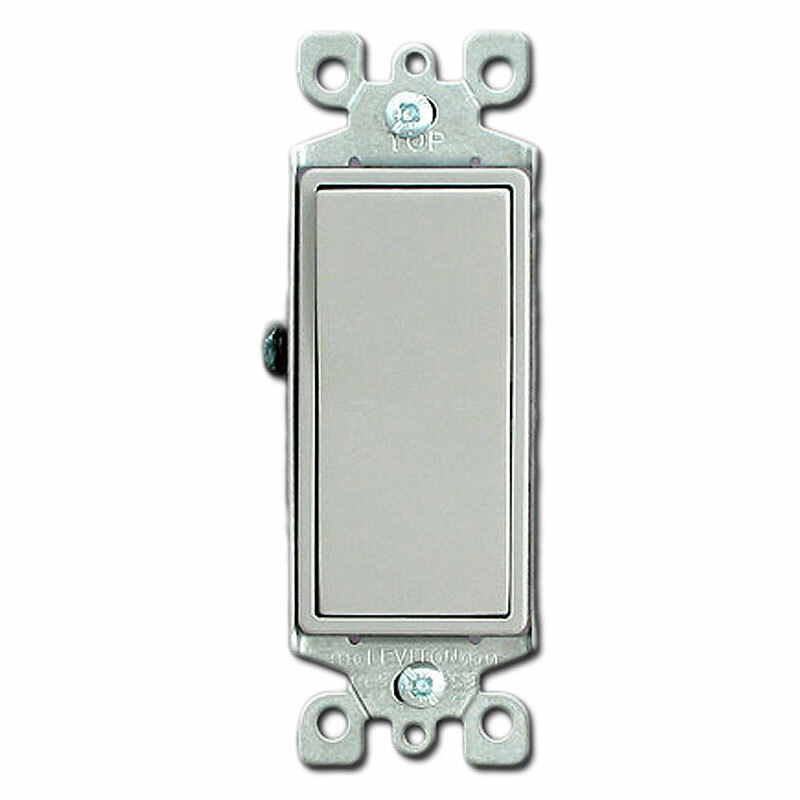 Buy rocker switches above to suit your particular project. Electrical light switches that work together to control a single light from two wall boxes - opposite ends of a hallway, both sides of a large room, or upstairs/downstairs - are actually called 3-way switches (the three points in the circuit are the light plus two electrical switches). 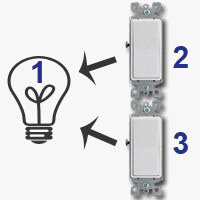 3-Way Rockers - Three way light switches allow control of a single light from 2 different locations. If, for example, you have 2 switches at opposite ends of a hallway that control the same light, you'll need 3-way switches in both locations. 4-Way Rocker Switches allow you to control a single light from 3 or more separate locations. 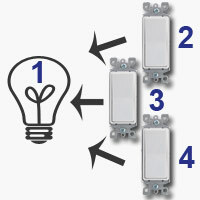 If you have 3 switches that will be controlling a single light, you will need to install 3-way switches on both ends (with 4-way switches filling the other 1+ locations). Dimmer Rocker Switches An added convenience, these unique rocker switches have an adjustable lever on the side that dims lighting to a comfortable level. Just preset it then simply flip the rocker up and down to have your room be perfectly lighted. Even with the small moving lever on the side, these rocker switches still fit into normal decorator light switch plates. Shop all light dimmer switches. Illuminated Rocker Light Switches Another variation popular for both safety and convenience reasons is the lighted rocker light switch. It has a faint light behind the main paddle that, when off, shines through making the device easier to find in the dark. Eliminates stumbling around at night trying to find the switch or giving up only to find yourself tripping over pets and toys, banging into furniture, or running into open doors. Note that on dark colors such as black and brown, the small night light is more obscured by the plastic so it glows very faintly. Shop all lighted switches. Buy Decora switch plate covers. Pilot Lighted Rocker Switch Illuminating when flipped on, these specialized switches alert you that lights are still on or that equipment is still running. Good for locations where you can't actually see the light (such as out of the way locations like in the garage or in the pool) or hear the equipment (pumps in ponds or fountains, etc). Buy pilot lighted switches. Stacked Rocker Switches These space-saving light switches are an excellent solution if you want to add extra lighting without having to replace your electrical wall box for a larger size. Choose from 2- or 3-switch devices that fit into the space of one. Single devices with 4 stacked switches have been discontinued. Depending on the brand, these rockers either rock up and down or left to right to control lights. (Leviton stacked switches rock horizontally; Pass & Seymour stacked switches rock vertically.) Versions are also available that combine a rocker switch with a receptacle for even greater convenience. 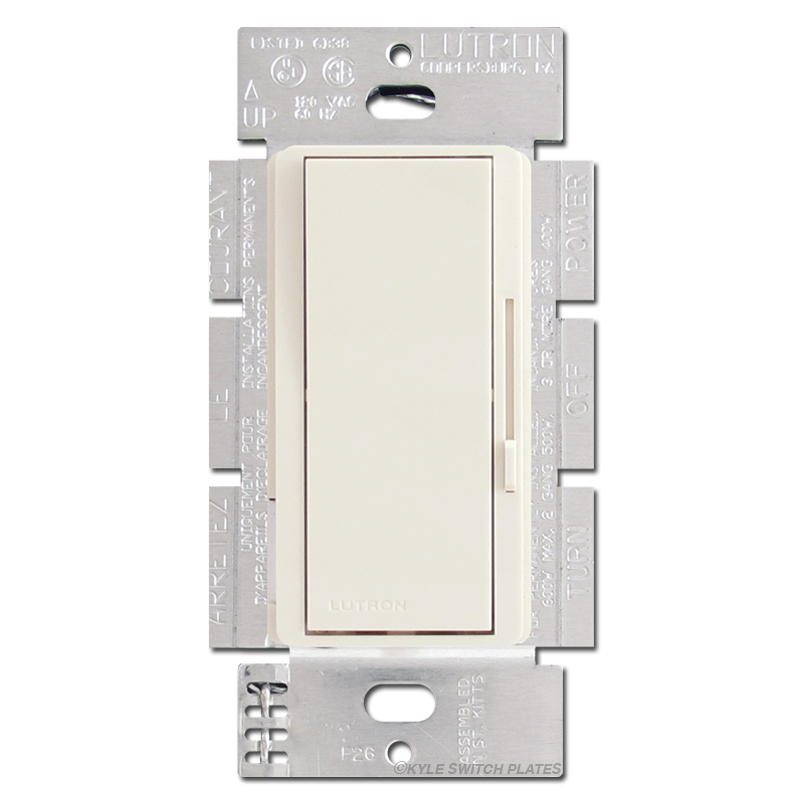 Find all that lighting convenience packed into a single device that still fits a regular rocker wall plate cover opening. Small Low Voltage Rocker Switches Vintage momentary light switches were typically mini rocker switches where rocking it up would turn lights on and down would turn them off. 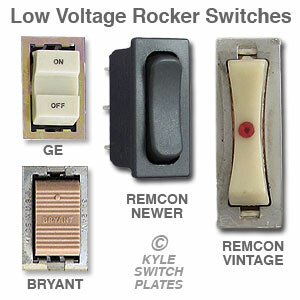 Many manufacturers including GE, Bryant, Sierra, Remcon sold a type of small low voltage rocker switch. This style was the inspiration for the large modern rocker switch found nowadays in newer homes that functions in the same way. (Rock up for on, rock down for off.) Although you still can buy low voltage rocker switch plate covers, the devices themselves have been discontinued and replaced with various types of low volt square push button switches. Note that round pushbutton switches (non-low voltage) are another specialized type altogether. Although some of these stacked mini rockers look like they would fit into a contemporary rocker switch plate, they do not. 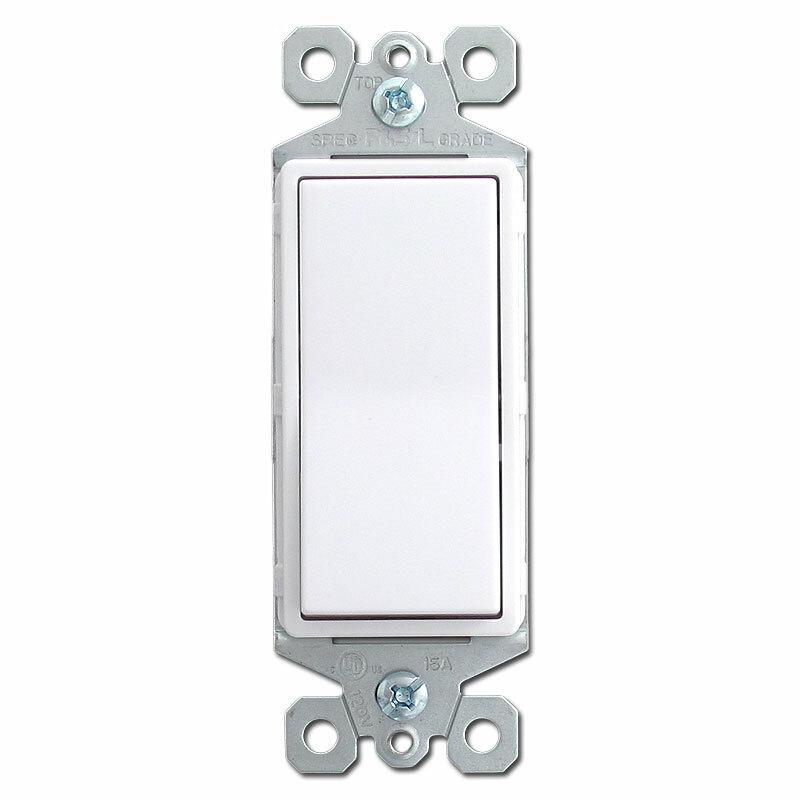 Buy Low Voltage Switches and Light Switch Covers if you need any of these specialized items. 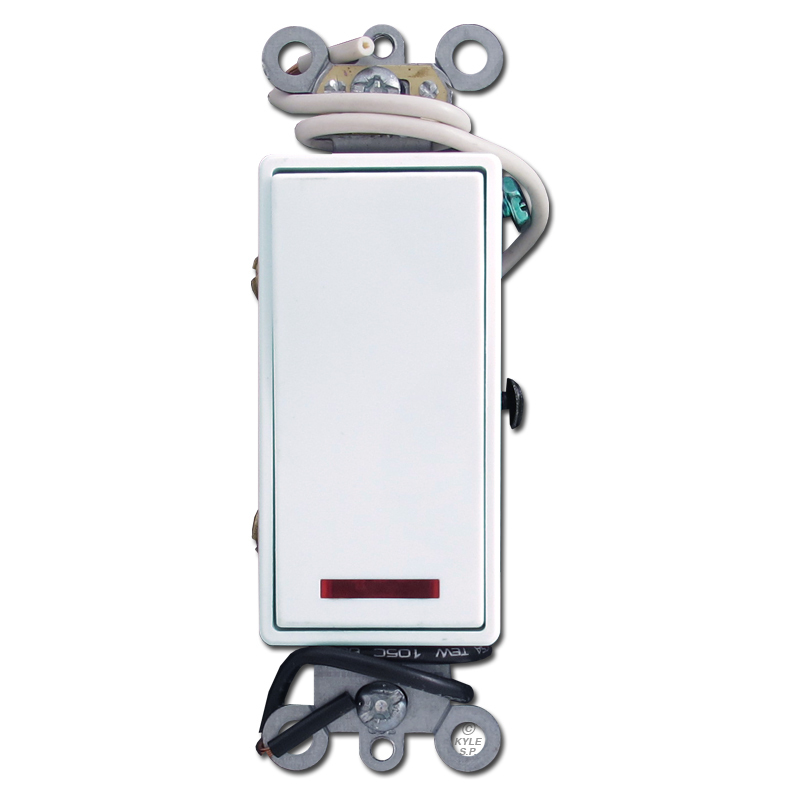 Narrow Rocker Switch Customers often ask if they need a narrow rocker switch or a narrow electrical box if they are installing narrow wall plates. Unless you have an old low voltage system and have the narrow rockers above, you do not need narrow rocker switches. They are not manufactured, nor are skinny electrical boxes. The devices still need the clearance around them, plus the boxes are hidden in the wall below the surface so it shouldn't matter, but check with a licensed electrician about your project to be sure your solution is correct. Buy narrow switch plate covers. Modern Styling Looking to upgrade to the style and convenience of modern Decora switches? 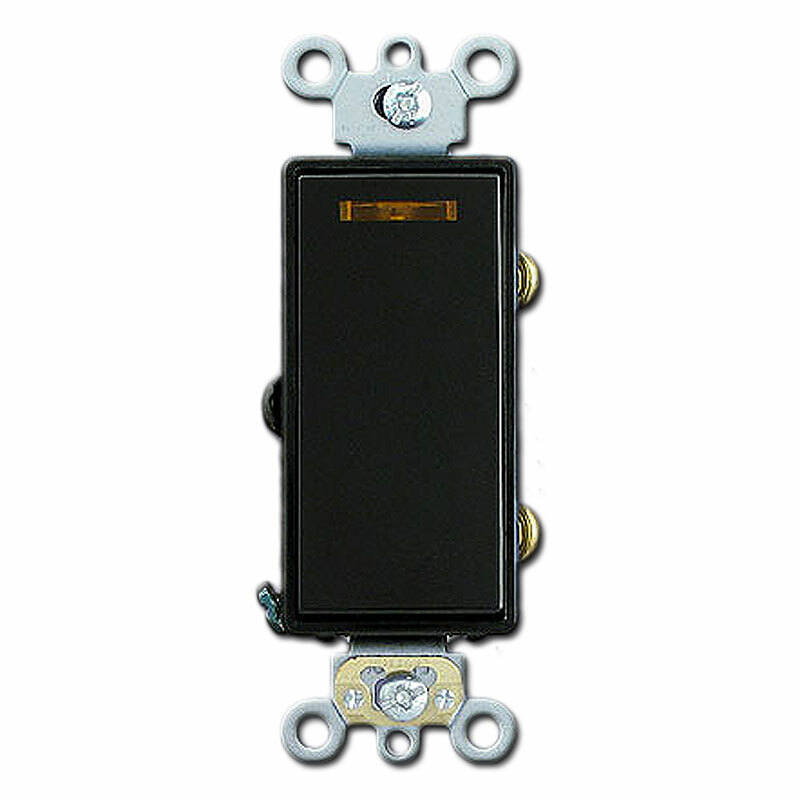 Choose from a wide variety of rocker light switch manufacturers to find the best rocker light switch colors and features for each location in your home. Find stacked Decora rocker light switches with two, three or even four buttons to fit one space in an electrical box; single pole, 3-way and 4-way electrical switches for controlling the lighting in your home from different locations; and lighted decorator switches that fit any rocker switch plate opening. Shop for decorator light switches in black, brown, white, ivory, light almond, gray and red that will coordinate beautifully with your wall plates and decor.